The landscaper’s hat is a much more important hat than many realise. The environment we provide is a critical element in a student’s perception about whether the library is for them and their choice to use it. can continually update their knowledge and upgrade their skills. is committed to lifelong learning. Their greatest assets will be what is between their ears and their ability to continually learn. 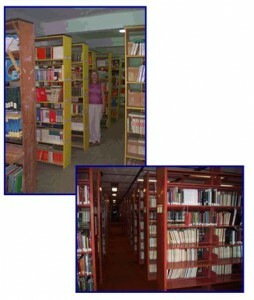 The library is the information center of the school and its staff are the information specialists. We know how to provide “[the] services that make specific suggestions about how to use the information, [how to] ask specific questions regarding the user’s business and practices, and perhaps provide interactive consultation” that Drucker (2001) says are necessary for the knowledge worker to be able to make meaning from the information. It is in the library, and through the programs and products that we offer, that the knowledge workers of the future will be nurtured. 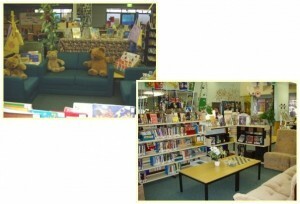 But to be nurtured, they need to be in the library and so it needs to be a place that invites them in. Does your library look like the one ruled over by Madam Pince at Hogwarts School of Witchcraft and Wizardry, in J. K. Rowling’s series about Harry Potter – “tens of thousands of books, thousands of shelves, hundreds of narrow rows”? Are those books standing shoulder-to-shoulder like soldiers in mufti, in strict alphabetical or numerical order, ranks only broken when some clever student breaks the code and finds what she is looking for? Is it quieter than troops being inspected by the general, a place only for reference and research, serious study, and no nonsense? Or is it a place that invites and excites? Or does it invite and excite? the brain absorbs information both directly and indirectly, continually aware of what is beyond the immediate focus of attention, to the extent that 70% of what is learned is not directly taught. the brain is “plastic” because its structure is changed (or ‘rewired’) by exposure to new experiences so the more we use it, the better it gets. the brain is stimulated by challenge and inhibited by threat, so students in safe, secure environments, both mental and physical, can allow their cognitive brains to dominate their emotional brains and will explore, investigate, take risks and learn. In addition, in What Do I Do on Monday? eminent educator John Holt talks to us about the four worlds of learning. The first world is that intense, personal world of our thoughts, emotions, attitudes, values, and preferences based on our experiences and how they have all merged to give us our perception of the world. It is a changing world, but the common core of beliefs strengthens as we age as we tend to take from experiences that which confirms those beliefs. The second world is that of the memory of what we have actually seen and done. It is the world of direct experience, the things we have seen, felt, smelt, touched, heard, tasted by ourselves and with others. These interactions with the world around us shape our World 1. The third world is the world we know because we have learned that it exists. It is the world of books, television, movies, plays, pictures, the internet – it is the world of words and pictures that others create for us to learn about. The fourth world is the world we don’t know about yet. It has no boundaries. It is a world of possibilities because we don’t know what is in it simply because we don’t know what we don’t know. As we learn each world influences the other. Learning is how we integrate our experiences into our knowing. The library is the gateway to World 3. Through the world of words and pictures we can introduce our students to worlds that they don’t yet know, or explore the worlds they have visited via television, the movies or the internet. 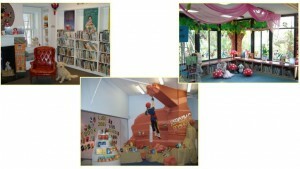 The library allows them to revisit their experiences in World 2, to shape their World 1 and have a peek into World 4. The astute teacher-librarian will understand the impact these research findings can have on the services we offer and how we offer them. 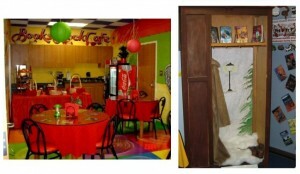 With a little imagination, it is easy to compromise between the austerity of Hogwarts and the flamboyance of the bookstore that thinks it is a coffee shop. 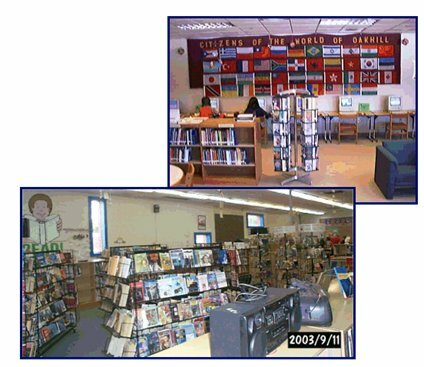 Your library can be a place where the students choose to be even when they don’t have to, as well as a must-see on the principal’s itinerary when prospective parents are shown through the school. And you can have confidence that the environment is built around sound pedagogical principles which provide sound evidence for the time you spend creating it. 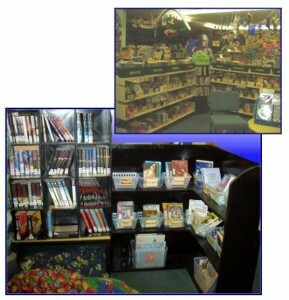 Giving your library the WOW factor does not mean having to change any of your core business practices. It just means examining what you do and considering how you could do it with a bit more flair. Answering those questions means you can develop a plan that organizes your space and provides you with a priority list of projects. Create a scale floorplan of your space and mark in the fixed furniture and fittings, windows and power points. Using your priority list place spaces that are dependent on those non-negotiables, such as the quiet reading corner near natural light and computers near power sources. Top priority must go to being able to see as much of the space as possible from the place you spend the majority of your time. Under duty-of-care legislation we are required to do “everything reasonably practical” to ensure the safety and well-being of those in our care. We are also charged with being in loco parentis (in place of the parent) so there is an extra layer of supervision imposed on us. Consider the needs of the disabled so they are able to operate as independently as possible – some authorities impose regulations about minimum width access aisles and so forth. Apart from those considerations, design the space for flexibility so it can be reconfigured to meet various and changing needs. Support motivation, collaboration and personalisation. Diana Rendina identifies six active spaces that all libraries should have. Above all the space should be a place where staff and students want to be, where there is mental and physical comfort, safety and security. Consider the unique aspects of being a child, especially if you are working with younger students. You need to bring the kids into the world of words before you can put the world of words into the world of kids. What to us seems to be a regular space and regular proportions, especially if we are familiar with it because it is our daily environment, can be very overwhelming for a small child. So we need to consider bringing the space down to their size and make it as friendly as possible so they feel that this is a place for them and they are welcome in it. High ceilings that seem to soar almost to heaven, can be “brought down” by hanging things like kites, or signs or swathes of fabric. 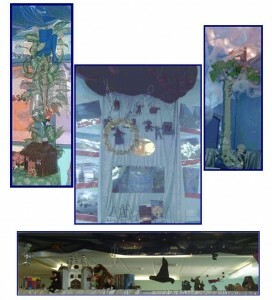 Connect the floor and the ceiling with Jack and the Beanstalk or other displays, or build semi-permanent displays on top of shelves. All fool the eye into thinking that this is a manageable, comfortable space to operate in. 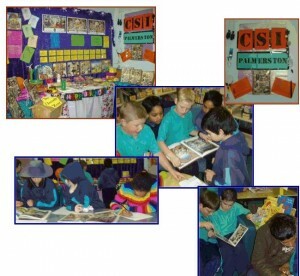 After making the space student-friendly, the most important consideration is access to the resources by the students. They need to be able to find either what they specifically want, or something that appeals to them, very quickly – that is the instant-gratification nature of the 21st century child. The days of taking time and pleasure in reading reviews, browsing titles, reading blurbs, flicking through pages and looking at pictures have slipped away, particularly as a library visit is likely to be squeezed in between changes in classes or shared with 30 other class members. Even using the OPAC for leisure reading selections comes second-place to an eye-catching display, a quirky title or a colourful cover. Even though the need for orderly, organized access is imperative for staff and important for students, rows and rows of shelves can be daunting. So think about how you can create or rearrange sections that make the popular titles easy to find by even the youngest patron or the most reluctant reader. Put yourself in the shoes of the new entrant who can confidently and independently find the books about dinosaurs. How do you feel? Put yourself in the shoes of the 6th grade student who would love to learn more about Tyrannosaurus Rex but does not want to publicise his ignorance about numbers by having to ask for help. How do you feel? If our students are to be regular users of the school library, or any other, then they must be able to access what they want easily and efficiently without any stigma or feeling of being marginalised. It is our job to make this place one where everyone can operate at their own level regardless of ability, gender, race, ethnicity, religious and cultural beliefs or sexual orientation. Many school libraries are reinventing themselves into a learning commons. The learning commons, sometimes called an “information commons,” has evolved from a combination library and computer lab into a full-service learning, research, and project space. 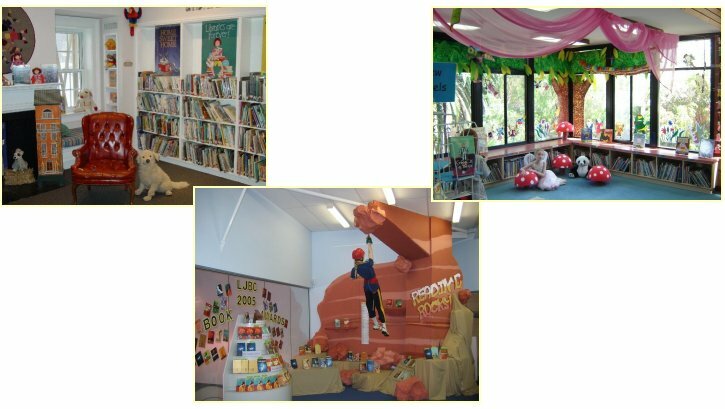 School libraries shelve tradition to create new learning spaces provides lots of examples, ideas and photographs of how to look at the space with new eyes. 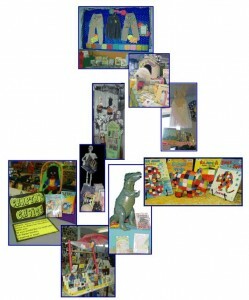 Many school libraries are including a makerspace and there is a gallery of these on Pinterest. If you don’t have space for a full makerspace consider devoting a table to a community jigsaw puzzle. Attaching thin dowel around the edges prevents the pieces falling off and it’s amazing how many stop to place a piece. Making your library say welcome is essential. 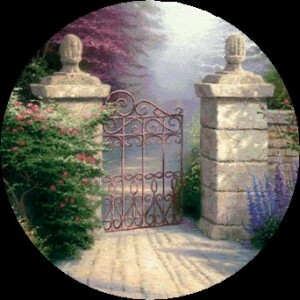 First impressions are critical so what happens at the front door is really important. Have the children create a Welcome sign and surround it with the word in all the languages spoken in your school. This display is a constant talking point even though it has been up for several years. Children traveling overseas often bring us a doll to add to the collection! On either side of the front door there is a water feature offering some movement and sound (the library is a talking place) that was our contribution to the ISLD Growing the Future project that was initiated after September 11, 2001. The poem above is the students’ version of John Marsden’s Prayer for the 21st Century. There is also an imposing RETURNS box. As well as making for easier administration, it serves as a constant reminder for those who are forgetful. This one is made from cardboard boxes and accessories from El Cheapos and it works for our little people but a more sophisticated one could easily be an opportunity for collaboration between you and the staff and students of the technology department. 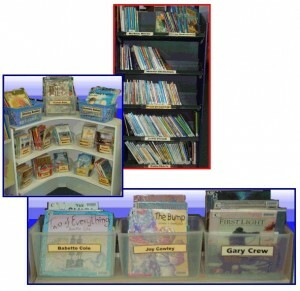 include books, both fiction and non-fiction, displayed with the topic and these are able to be borrowed while the interest is piqued. It all helps to create the perception that the library is an exciting and interesting place to be, somewhere where it is worthwhile to spend their time because there are always new things to discover. If you’re stuck for an idea here are 30 Quirky Quickies. 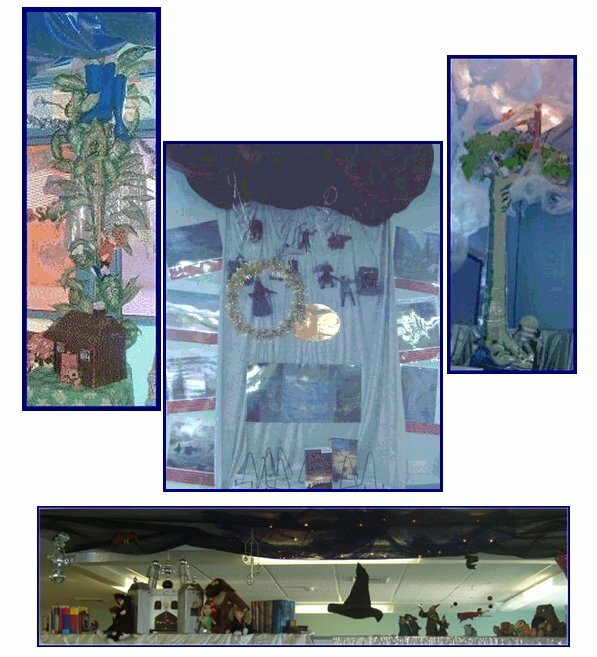 If you want inspiration for your displays then there are ideas aplenty at Library Displays and School Library Displays or you can search Pinterest or even Google images for either general designs or your particular theme. Tusitala’s Chair – named after Robert Louis Stevenson who took the native Samoan name meaning “teller of tales”. Strive to provide areas where clients can just curl up and read – either to themselves, to others or even a friendly teddy. 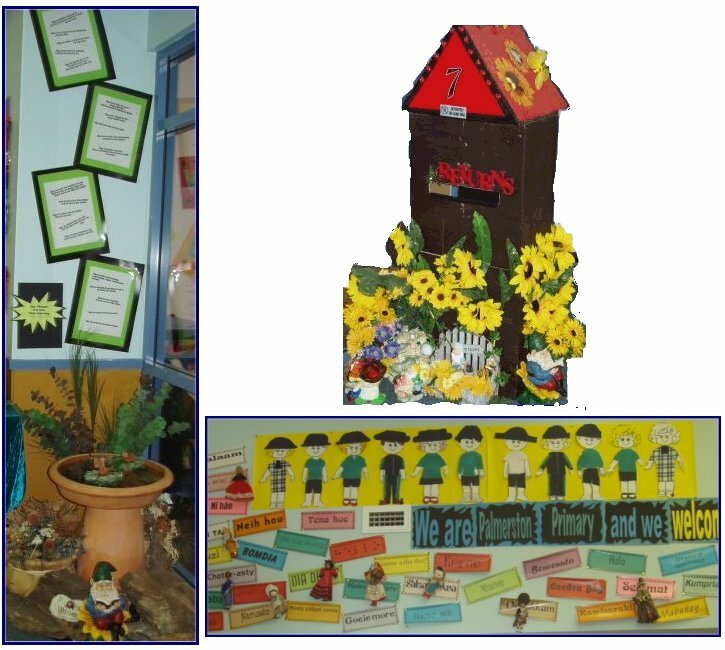 Create child-friendly spaces with permanent displays that encourage and enable independent choice and selection. An array of authors…plastic tubs are cheap. all the perennial favourite characters such as Winnie-the-Pooh, Franklin, Spot, Arthur, and Elmer under the banner of Family Favourites – again, the children feel very grown up being able to find these for themselves and show their parents who often come in after to school to borrow together. all the works by popular and prolific authors together. If you see a display stand in a shop, don’t be shy about asking if you can have it when their display is over for your library. Often they will be grateful that they don’t have to worry about disposing of it. Cover any unwanted advertising with colorful, self-adhesive paper, turn the header board inside out and create your own, and for the time it took you to collect it, you have a personalized yet professional stand. Ask for the posters and any other paraphernalia that accompanies the display and then re-create the display in your library. Even though it make take some time to arrange your collection like this, the increase in circulation and students’ discussions and recommendations will make it more than worthwhile. Many researchers have proven that the key factor in book selection is the book’s cover, so it makes sense to display as many books with their covers showing as you can. Think of some of the more successful bookstores that you have visited. Do you spend ages getting a crick in your neck because it is turned sideways to read titles on spines? 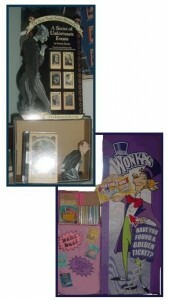 Or are you attracted to those books whose covers you can see? Did you know that, just as in supermarkets, publishers pay bookstores for a book to be displayed with the cover facing out, because they know that the cover sells the product? Like us, children don’t choose books that look like they have “don’t touch me” signs on them, that are lined up with just a sliver of spine bravely trying to sell themselves and packed so tightly that little fingers cannot prize them apart, creating a barrier rather than a gateway. 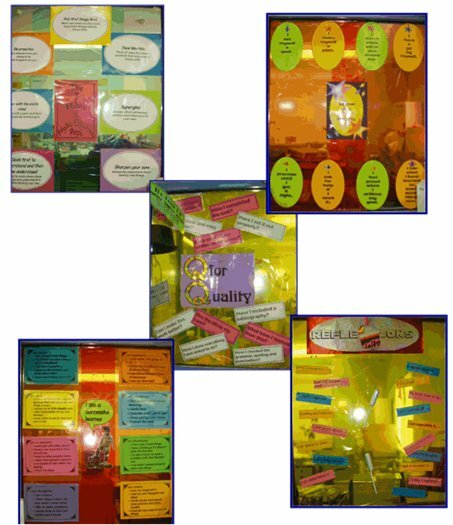 Make mini-displays wherever you can that allow covers to be displayed and to give the students greater access to new authors, genres and topics. 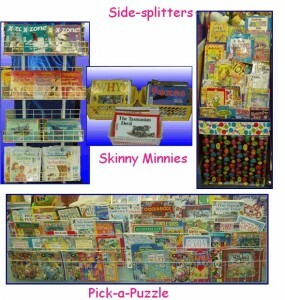 These can be about anything that takes your or the students’ fancy, be as large or as small as space allows, and be as temporary or permanent as you want, but the aim is to get the covers of the books to catch the eye. Encourage the students to have input to and ownership of the space by inviting them to create displays; asking class teachers to contribute the students’ work to accompany collaborative research projects and inviting them to read, reflect and review their reading and share it with others. Encourage students to have ownership of the space by seeking their input. In the 1870s, Melville Dewey spent a lot of time organizing subject areas to create a classification system that is now used in more than 200,000 libraries in 135 countries in more than 30 languages. According to the Online Library Computer Center (OCLC), the official owners of the Dewey system, 95 percent of all public and K-12 school libraries use the system. 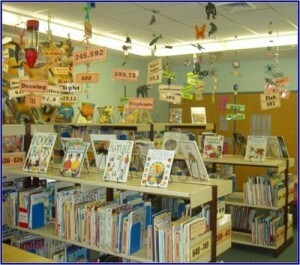 While it is very important that our students know how to use this system to be able to find specific titles, and there is a strong argument that understanding how to locate a resource is a transferable lifelong skill, it is not much use to them if the students cannot and do not want to read. So, in the elementary system at least, there is an equally strong argument for manipulating the arrangement so that students are encouraged to choose to read. Time enough for them to learn the difference between 994.04 and 994.4. The nature of non-fiction means that more-or-less adhering to the Dewey Decimal Classification system in the non fiction sector of the library makes sense. Even if you use a simpler adaptation to meet the needs of your students, staying within the basic concept encourages independence and helps them build lifelong skills. Nevertheless, it is still possible to make certain subjects easier to access and circulate. Again, do some in-house investigations to identify the subjects most often borrowed by the students, particularly for leisure reading. Books about topics such as space, pets, dinosaurs and cars are usually borrowed before they are shelved, so consider giving these a space of their own in your non-fiction section. Despite their not being in strict Dewey order, students very quickly learn to locate their favourite sections so they can make their selections independently. Circulation data shows that non-fiction displayed in a similar way to fiction is much more likely to be borrowed, and that even if the reader is just looking at the pictures, there is a lot of information being absorbed, including the format and structure of this type of text. Be very aware of what is being studied in classrooms, is on the news, or is topical with students and be pro-active by displaying resources about those subjects while they are of such interest. Whether you landscape your library strictly according to the principles of the Dewey system, or whether you are more flexible, the key to unlocking the space for the user is signage. Everything must be clearly labeled so that even the very youngest student, or one with specific special needs, can find what they are looking for with a minimum of help. Being able to find what you want for yourself is very empowering and being able to show someone else, particularly a parent, is the icing on the cake. Near the non-fiction section display posters that summarize the DDC system and also a ready reference so that the student wanting a book about the moon can see at a glance that there will be something at 523.3. 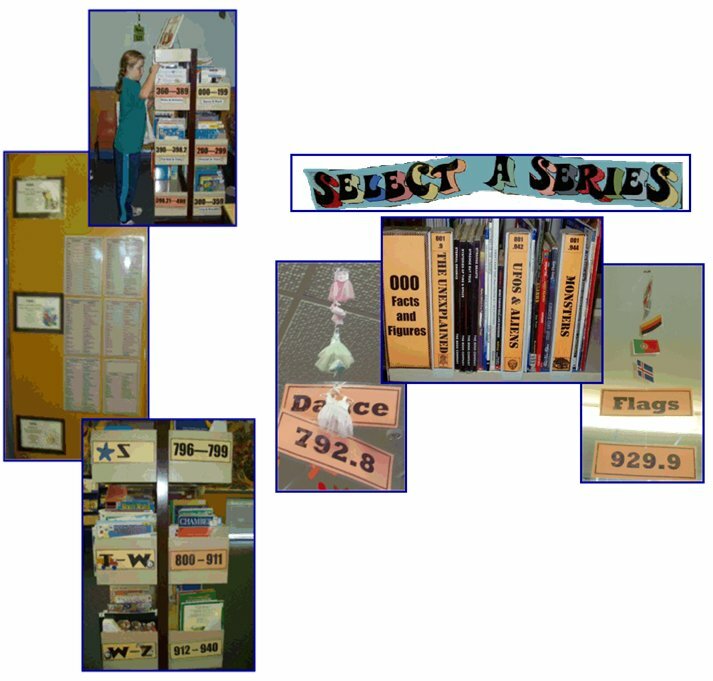 In your non-fiction section label the shelves so the student can see just which numbers are housed there, but make sure they know that 500-510 also includes the numbers in between. If you have space, list the main topic areas covered. Sub-divide the books into practical breaks using index blocks available from your library-supply store, or recycle plastic video boxes. Assign numbers that make sense rather than just an arbitrary number of digits. The more divisions, the easier it is to find (and shelve) what you are looking for and reinforces the belief that this is a space where the child can operate independently. In your fiction section, label every ”room”, shelf, container and display, particularly if you have diverged from the standard DDC layout. Such clear signage means that students soon learn where to look for those out-of-order books and shelving them after they have been returned also becomes much easier, especially for student and parent volunteers. 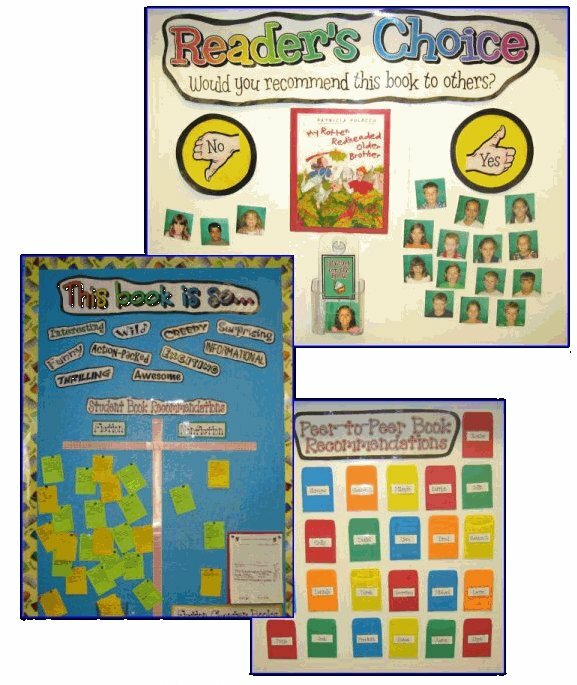 we can do much to support our students’ reading by ensuring displays have captions or even provocative questions that lead to further investigations. Bare walls can be covered with children’s work samples or charts that support their learning. It will all be absorbed at an unconscious level. Wherever you can have the students contribute to the wording, design and construction of the charts. Ownership is a powerful motivator. 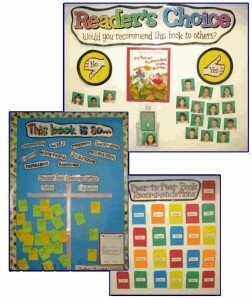 Charts can include behaviour guidelines, borrowing instructions, instructions for using the OPAC or caring for books. It gives them ownership of the space and is one more way to put the world of words into their world. Captions and instructions encourage students to read. So you don’t have to be an interior designer (frustrated or otherwise) to landscape your library. Every time you go shopping, look at displays and how they are constructed and then take the ideas and elements and reproduce them. Think of it as recycling – their research and its output into your environment – two displays for the cost of one! There are many subtle ways that they get us to part with our money. Consider how you might employ some of these tempters in your library. 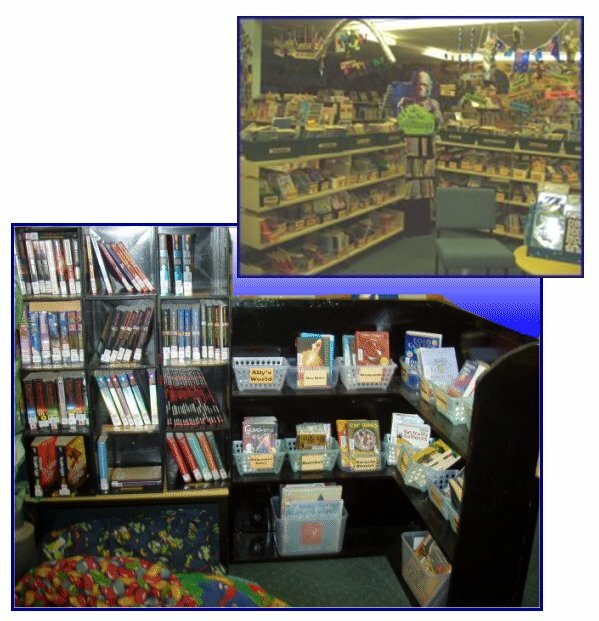 With just a little knowledge and lots of imagination you can make your library a model of the very best in student learning environments and know that you are putting the world of words into the world of kids. 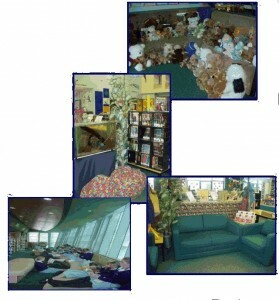 Can the physical environment have an impact on the learning environment?